History is simply a collection of dates, events and often memories that are attached to them. For some Leeds fans, they remember all too well the memories attached to the great LEEDS UNITED FOOTBALL CLUB. 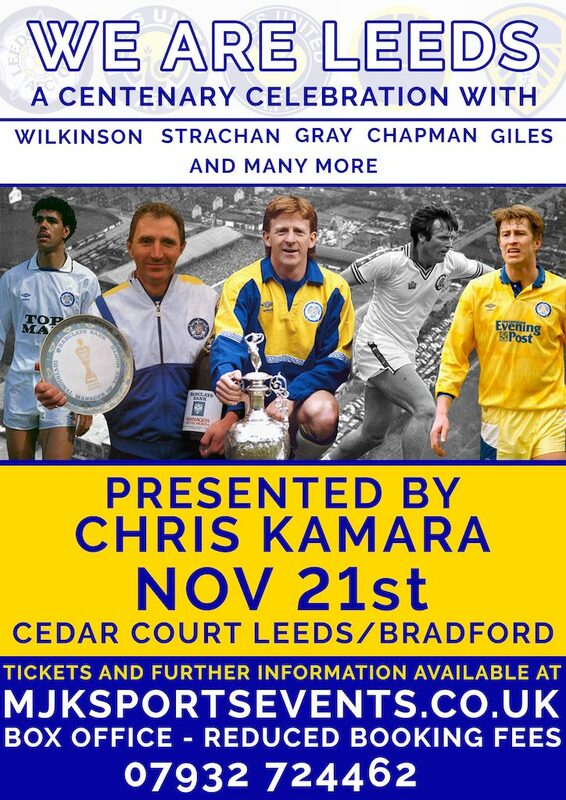 On Nov the 21st at the Cedar Court hotel Leeds Bradford MJK SPORTS EVENTS are proud to bring you WE ARE LEEDS, a centenary event celebrating and taking a look back at 100 years of the great LEEDS UNITED. PLUS MANY MORE SPECIAL GUEST EX PLAYERS. Take a step back in time and relive A HUNDRED YEARS OF events that are now part of Leeds United’s history. On the night, each of the players present will be individually interviewed by Kammy along with career highlights shown on our big screens. After this SGT WILKO will give us an extended insight in to his time at the club and what it meant to manage during such a successful period. An audience Q/A session will follow this with all the guest speakers present. Add in two extended videos, a few special messages from ex players and you have an unmissable event for LUFC supporters – an event that will bring the past right up to the present. Book Friday off work as this will be a night to remember !!! VIP £99 Cat A Table seats on tables of 10. Two course meal. One of our special guests will be seated at your table. Gold. £69 Table seats on tables of 10. Two course meal. A picture with a guest of your choice. Entry only. £40 Table seats on tables of 10. A picture with a guest of your choice. A picture with a guest of your choice. Table seats on tables of 10.